The weekend took forever to get here and once it arrived it only paid me a fleeting visit. The last two weekends have been busy with Mother’s Day and birthdays. On both occasions I was delighted to go shopping and not spend that special man & machine time that only petrol heads understand. Saturday started with the left hand front brake drum, it was de-rusted and had two coats of Rustcure applied. Next weekend it will get the VHT caliper spray applied. I also managed to do a few jobs in the garage. The main one was to cable clip the solar power charger cable to the wall. This was going fine until I got to the front of the car. Now the car just fits in the garage and I have to squeeze around the front to get the other side. This is a carefully controlled operation as the front of the car is on axle stands and there is no protection around the hood catch. I mention this as the hood catch is around the same height as my man equivalent of, two sockets and a ratchet. On squeezing past the open hood in the middle part, there is a sharp corner that caught the standard issue jogging bottoms and ripped a little hole. I was waiting for the pain and the feeling of blood. Carefully I checked all was in place and making sure there was no damaged areas that the cold was masking. Now from a distance it may have looked strange a man rubbing his socket set in front of an open hooded car. I know that 289ci engine is pretty good, but I don’t think I would go that far! After the near miss I decided that the hood catch would also be coming off too. I got the proper tools and it was off. Sunday was strip down of the hood catch and treat it. The photo set can be found under the Photo menu, Bodywork, hood catch or click here. All was ok apart from a few rusted bolts that needed a little persuasion to come out. There was no horrendous rust on there and it just looked worse than it was, in fact it was quite solid. I had set the alarm to come inside and watch the first race of the season Formula 1 in Australia. I put my headphones on so I didn’t disturb the wife. It was a good race and pretty even with an unexpected winner which makes a nice change. After the race had finished I picked up the blog on my Tablet PC, I edited some photos and created a page(s) for them. I have also uploaded my review of my Halfords Advanced Pro 120 Socket Set under Tool Reviews or click here. Why was I able to do all of this? Saturday the wife went shopping and came home to do some work and online banking. Today she has been at my PC all day doing various things, and marking books. As she has been busy all day and I have kept out of her way. Let it be said that although teachers have long holidays, they spend most of their time planning, organising and marking. I have hardly seen her this weekend. For me that’s a sad thing, as we haven’t even managed to curl up and watch a film like we love to do at the weekends. For me it’s been a strange bitter-sweet day, lots done on the car, but I really haven’t seen my wife. Throughout the weekend she will usually pop out to see what I am up to at least a couple of times a day. I feel sad for her as she hasn’t seemed to of had a break. 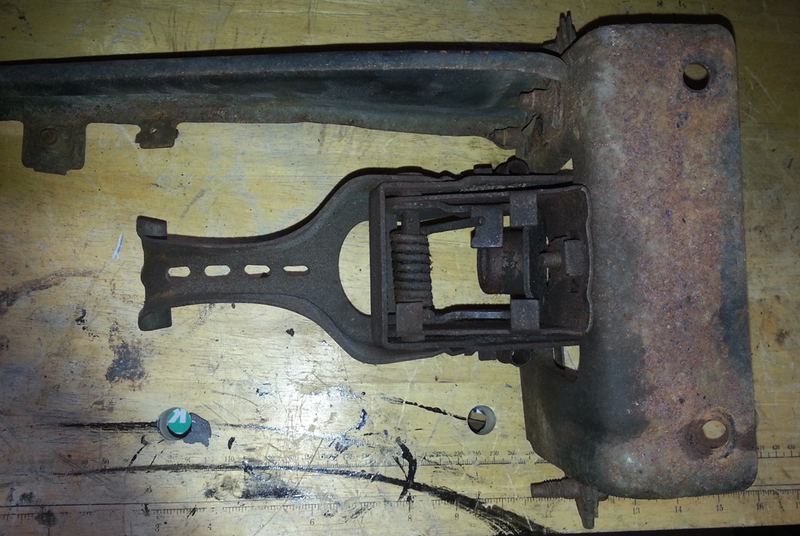 This entry was posted in Blog, Car, General, Photo's, Reviews and tagged 289, caliper, formula 1, garage, hood catch, Mustangs, rust, socket and ratchet, strip down. Bookmark the permalink. What an outstandingly well written and humorous posting. I’m glad it all turned out okay. 🙂 It was awesome of you to give such thoughtful shout outs about your wife. I knew my husband couldn’t be the only one who appreciates what teachers do behind the scenes. Thanks for the kind words. I do miss her when she’s not around, we are best friends as well as husband and wife. Teaching is such an important job and stressful. It shapes our future generations and all they get is sworn at and abuse. They are a special breed that’s for sure.